If discrete communications are important to you, you’ll want your accessories to be discrete as well. They’re very comfortable, easy to use and it lets users keep radios on their belts. That helps extend the radio’s life because it has less chance of being dropped. With earpieces (or surveillance kits), you can run the wires under your clothing and the earpiece is so small that it’s almost invisible. Give our Communications Consultants a call today to find out which earpiece is right for your 2 way radio. 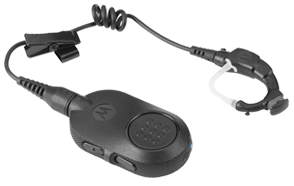 The Motorola NNTN8459a is a single wire surveillance kit that offers push to talk with an in-line microphone. Perfect surveillance kit to keep two way radio communications discreet. For assistance finding a comparable replacement, contact one of our experienced Account Managers at 800-338-1949.